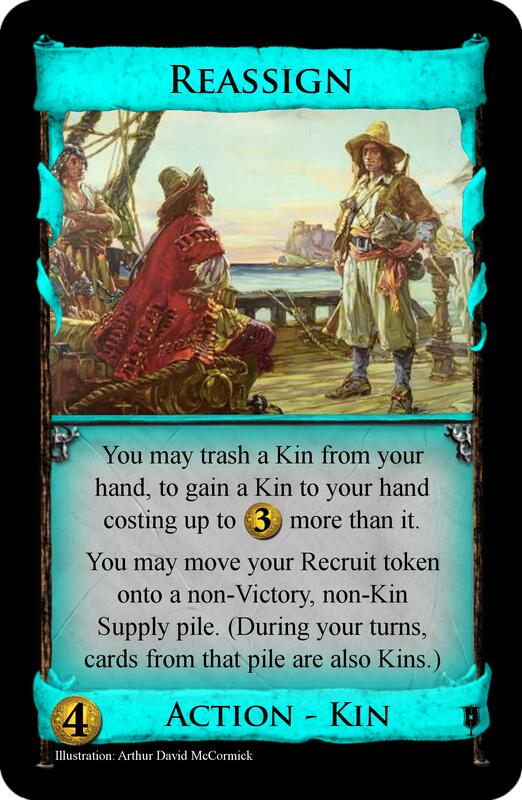 It's probably too late to say, but I feel that it might be interesting if being a Kin increased the cost of a card that it affected; meaning, with sort of the older model, if you were giving trashing to a Shanty Town, it would also cost +$1. I've learned that the less a Kin does to change a card the better, so analysis paralysis is lessened. 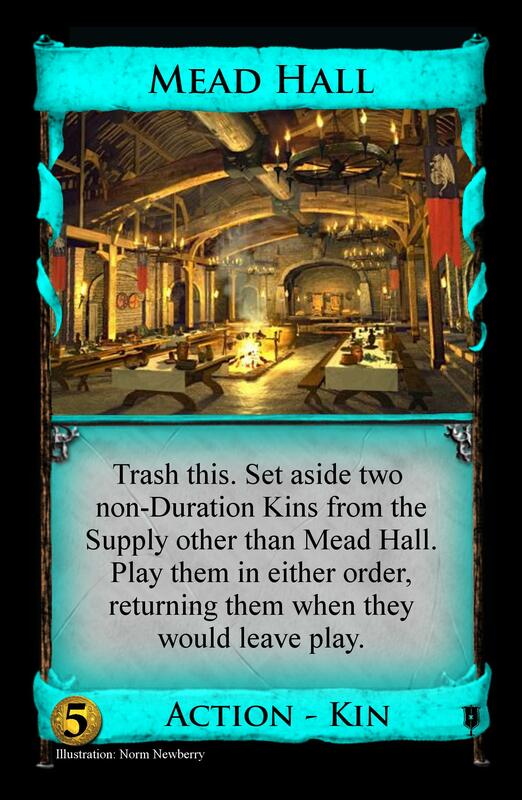 Mead Hall might be a bad design anyway. Armoursmith - Action, $4 cost. If your deck and discard pile empty while this is in play, trash this. When you gain this, each other player looks at the top 2 cards of their deck, discards any number, and puts the rest back in any order. Simple draw that can't be put in a full deck-draw engine so easily. Simplicity is the key here to make analysing how Kins affect this easier. As much as I'd love to not have the bottom bit, it feels like a $4.5 cost card so the gift to other players knocks this down to $4 whilst softens the early deck cycling advantage this gives. Potter - Action, $4 cost. 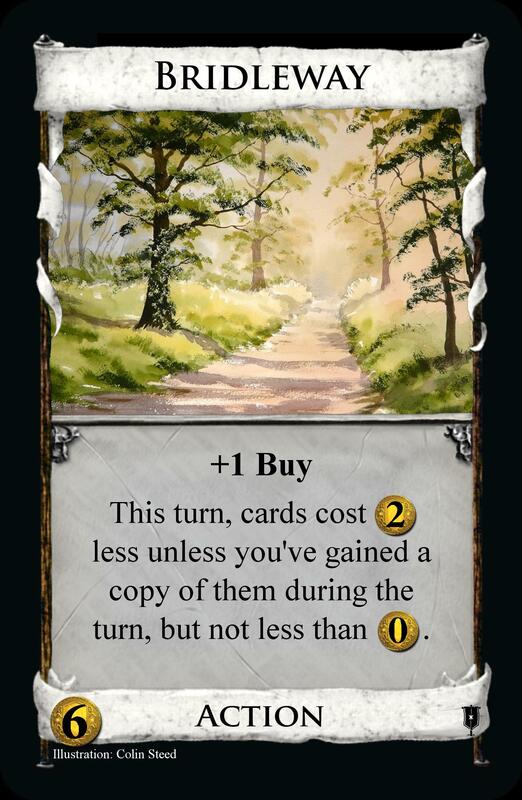 Gain a card costing up to $4. 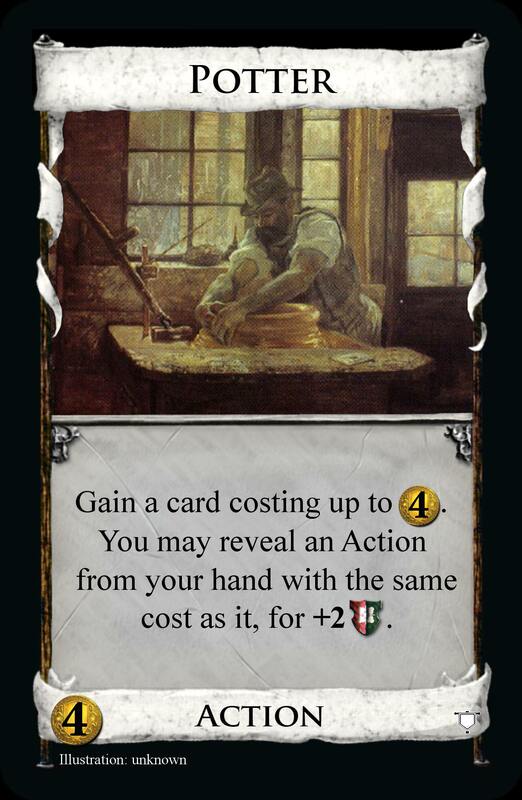 You may reveal an Action from your hand with the same cost as it, for +2VP. More VP tokens to accompany Pillar. A Workshop that can get you ahead on points if you play things right. Farrier - Action, $3 cost. Rider - Action, $5 cost. 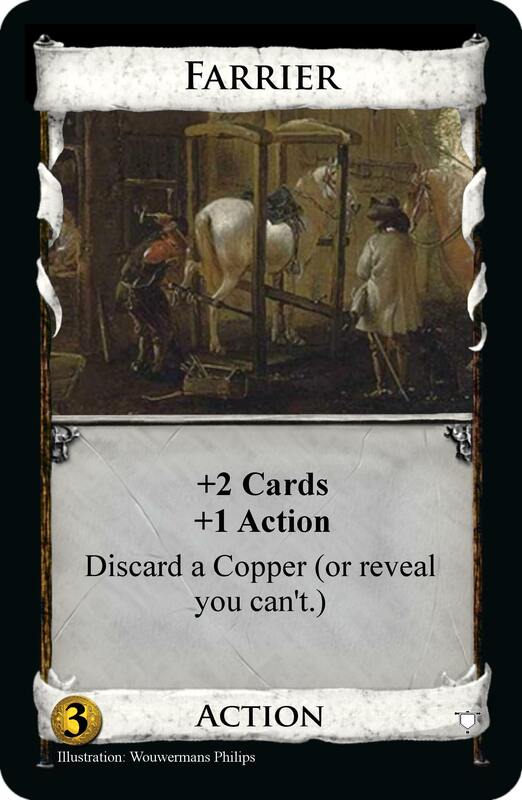 +1 Card per Farrier you have in play. Discard any number of cards. 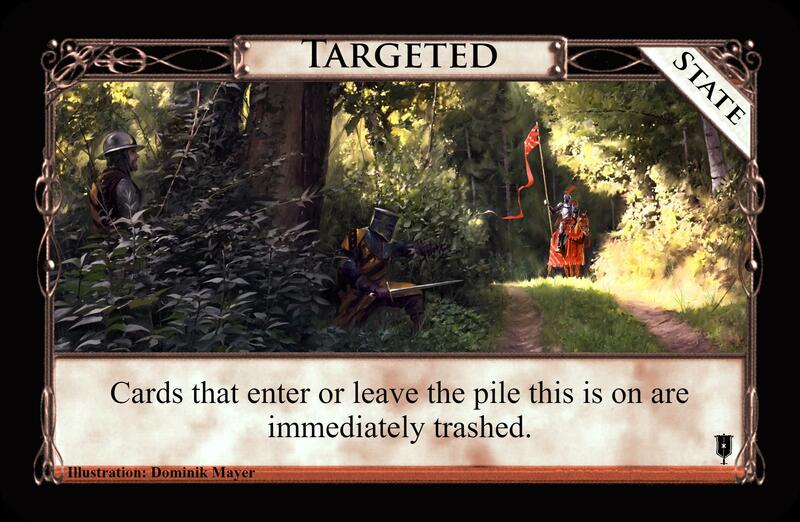 + $1 per card discarded per Rider you have in play. Split pile to go with Travelling Merchant, and split piles fit well in the set anyway. Farrier is drawing cards for you somehow, either as a late Lab or as fuel for Rider's draw, and the Rider himself Vaults the draw away for payload. Besides other things. These are all very interesting cards. I have a hard time judging Armoursmith and Rider but on the first glance they look sound. 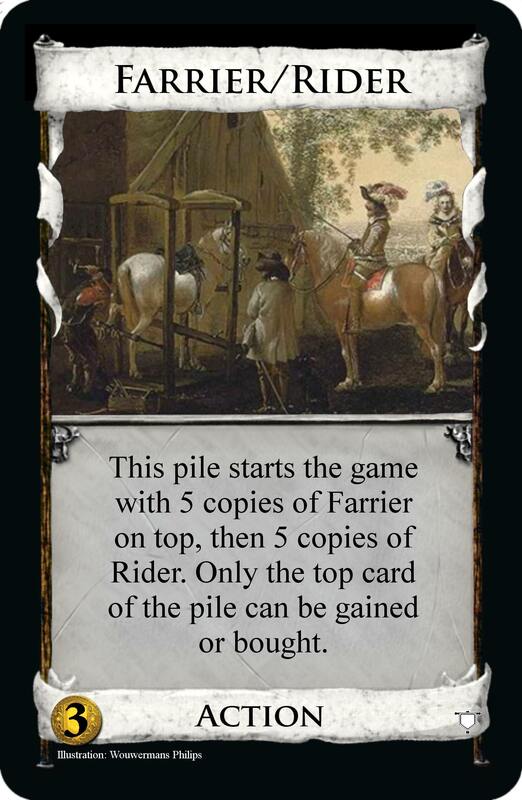 Farrier could be too good for $3 if there is a run on the pile in many games so it might have to cost $4. But on the other hand opening double Farrier isn't that brilliant: some cycling, no boost to the economy and you could end up in a similar situation as somebody who mindlessly buys Saunas in the opening. Announcing an OP update to the Kins. 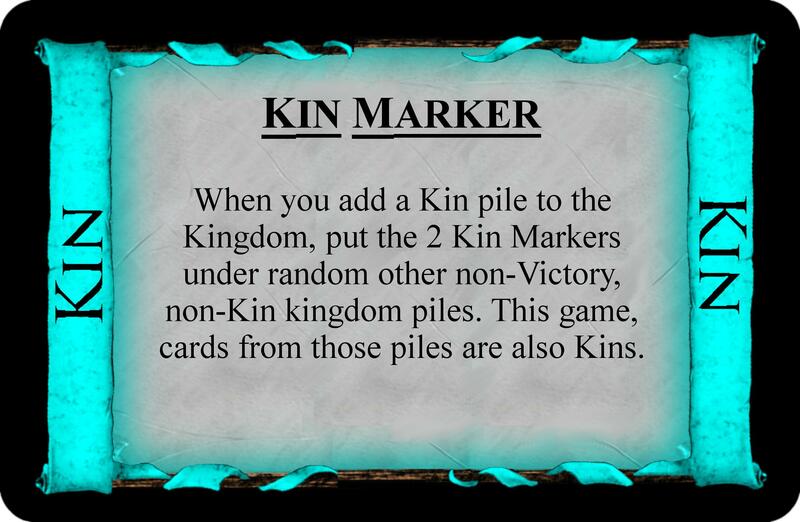 It made more practical sense to have the 2 counters that show other piles are Kins instead be sideways cards that go under the pile, like the bane marker. Just a theme change for Vice, if everyone attends the tribal festival the Chief is in a jolly mood so he's happy to join you. Mead Hall is rather different now, the trashing has gone and it plays other Kins in a more exciting way. It effectively becomes two Kins put together, or one doubled up, which can include Treasure and Night Kins for maximum usability. Most of the time this is powerful, so it's a one-shot. It's more unique, there's better interactivity and it will sometimes be bad. A simplified Reassign. If it can get away without being a Night, that'll be better for the set I think, though the top could be too strong like this. And something that Capitalism helped with, wording the Recruit token instructions simply. Pearl has no Buy on it now, unnecessary. Am I missing a trick with not having it be gained to the bottom of the deck? Exile is out for being too oppressive, but look at the new ideas and you'll see what came of it. Highland Village was similar to the former Mead Hall, not exactly bad but it could be more interactive. There's already Festival Grounds, so it's out. Runner as it is doesn't really work as I'd like, but there's definitely a pure Kin support card to be made somehow. Rivals - Action Attack Duration Kin, $4 cost. 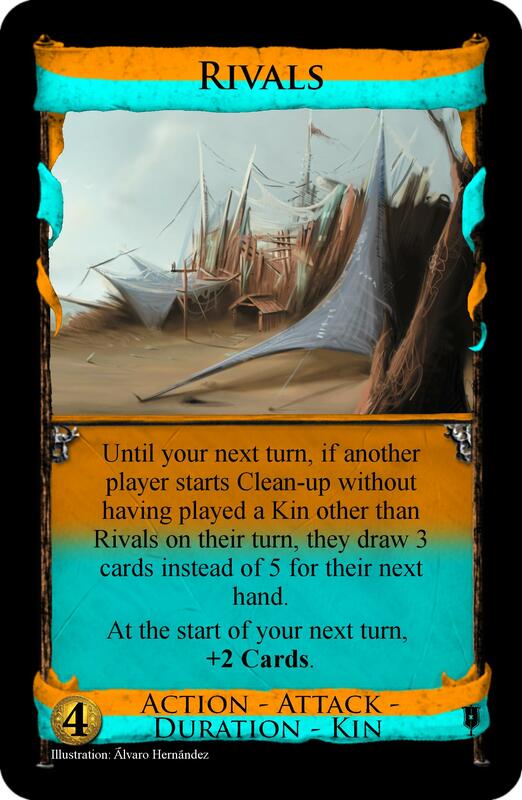 Until your next turn, if another player starts Clean-up without having played a Kin other than Rivals on their turn, they draw 3 cards for their next hand instead of 5. At the start of your next turn, +2 Cards. Trying to retain the 'this likes bad Kins' interaction from Exile. Making them block an Attack seems the best way to encourage getting them whilst being fun to play with. Having them reveal it from hand like Moat can sometimes fail despite great effort. So I went with making them play it, which can help make things a bit nastier in the best/worst cases. And it turns out rather like a reversed Telltale. 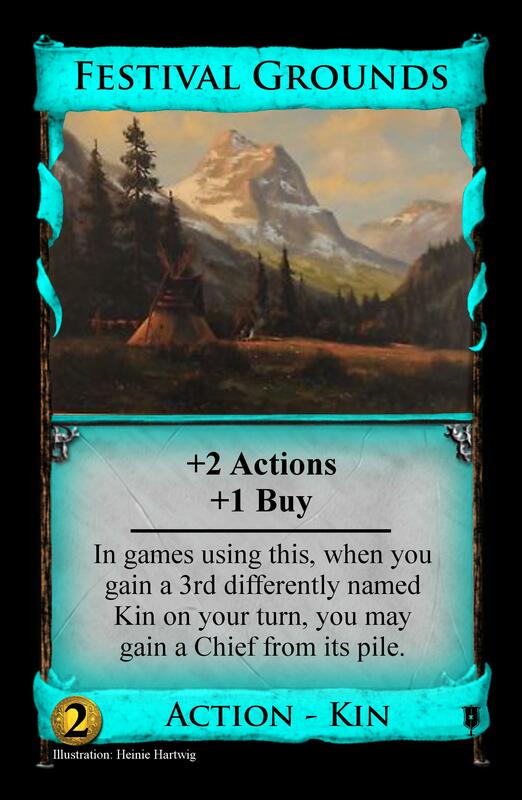 Secret Keeper - Action Kin, $5 cost. 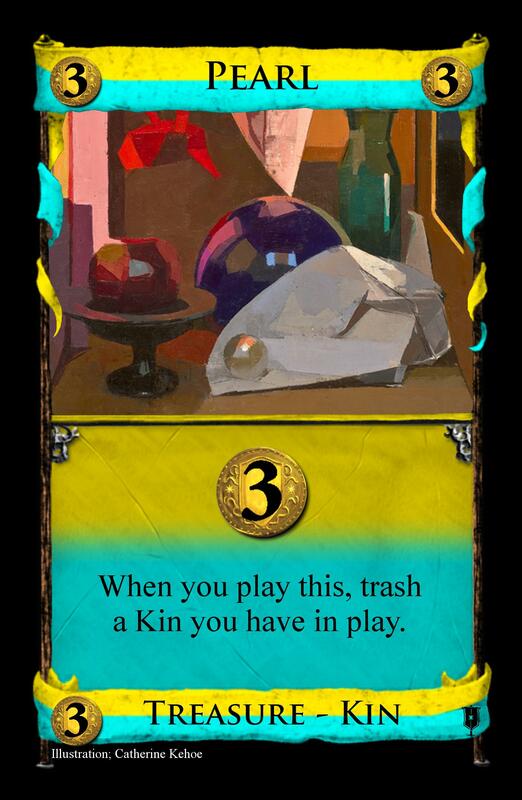 If you have 1 or more Kins in play, +2 Cards. If 2 or more, + $2. In games using this, when you gain a Kin, each other player gets +1VP. 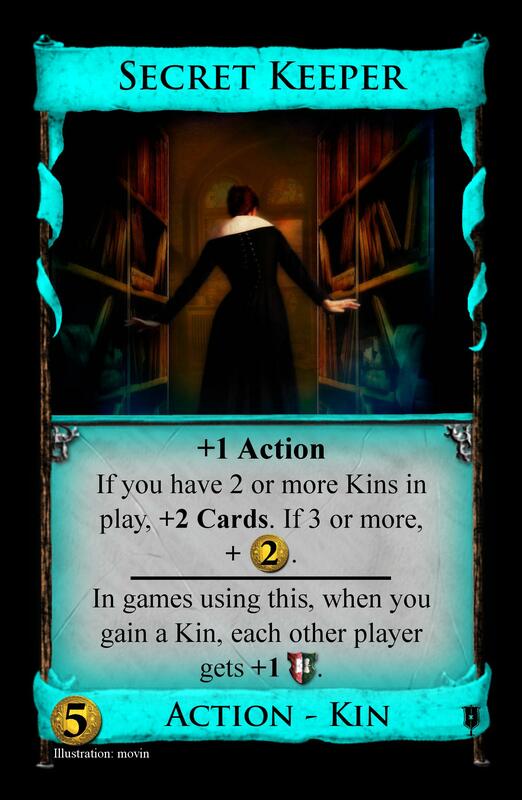 And here's the negative VP Kins bit from Exile; conveniently VP tokens will be a feature of the set so I can better implement negative VP by permanent +VP to other players. No sneakily trashing them at the end. From there it made sense to have a top that gave very convincing reasons to invest in the Tribe anyway. This might not be enough even like this. I feel this is now a set of convincing and diverse Kin cards. But I also see there are many designs possible. Possibly I've missed something good. I don't understand: a farrior is a laboratory but with cost of $3 instead of $5? So i would buy two Farriors at the start and will win with Big Money? 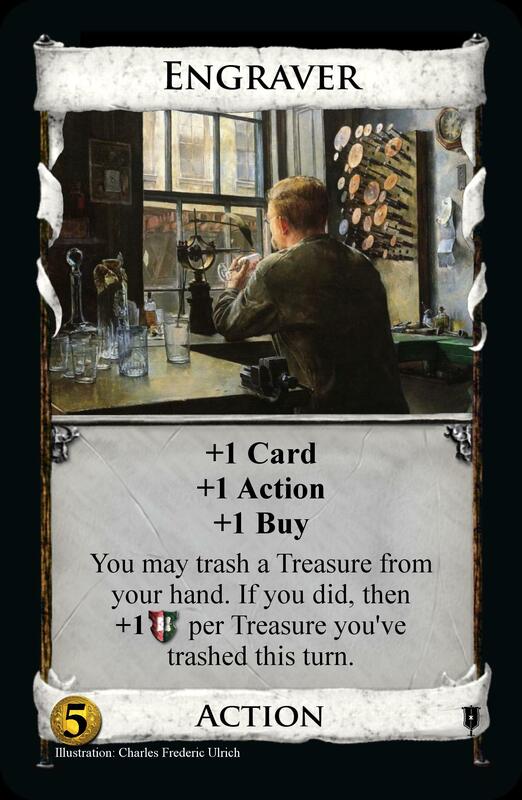 After the laboratory bit, you're forced to discard a Copper from your hand. So to start with it helps neither hand size nor money, only cycling. If you get to trash your Coppers, then it can become a lab. 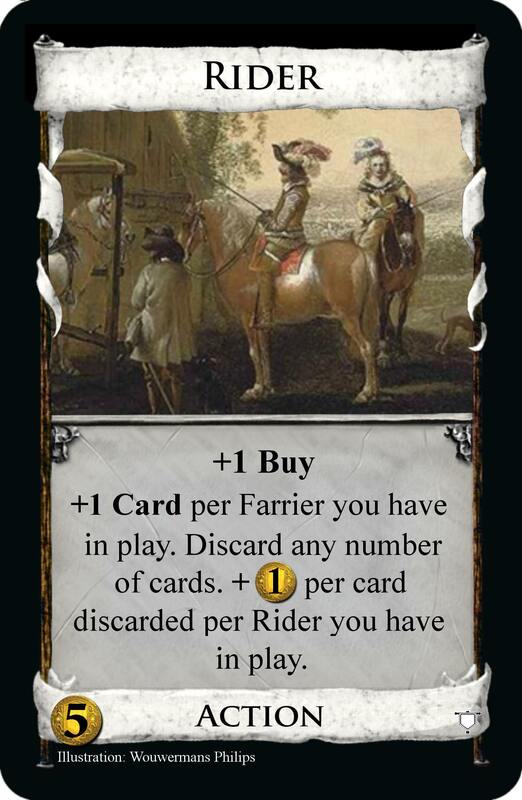 The only reason I can think of to start with 2 Farriers is if you really, really want to boost the Riders you buy later and make sure your opponents don't stop you. Mail Coach moves over from Revolution, as a Bridleway. 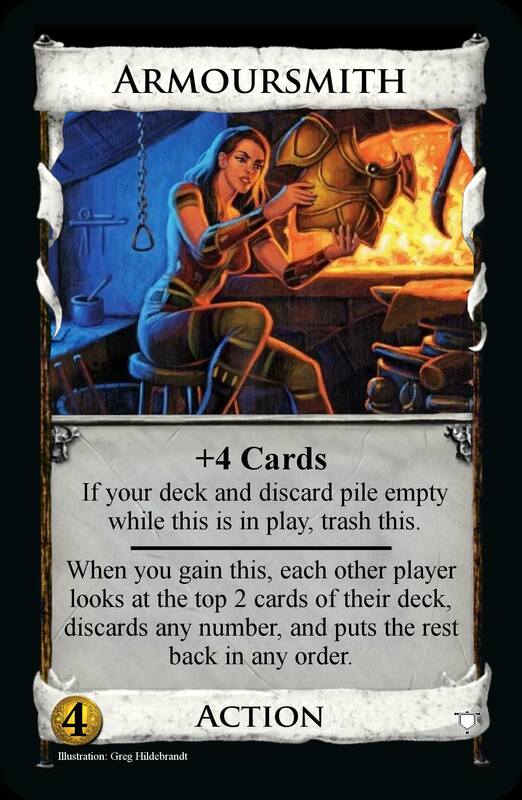 Engraver, a cantrip Treasure trasher with a Buy that gets VP for trashed Treasures in the manner of Priest. 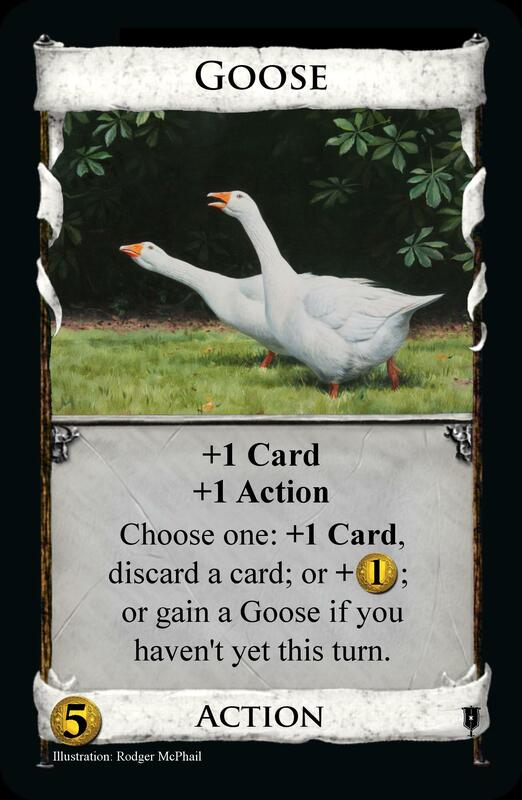 Goose; a Peddler and a Fugitive, each $4.5 effects, put together as a choice with a slow self-gain effect for a $5 card. Not great for its cost until you can accumulate several copies. 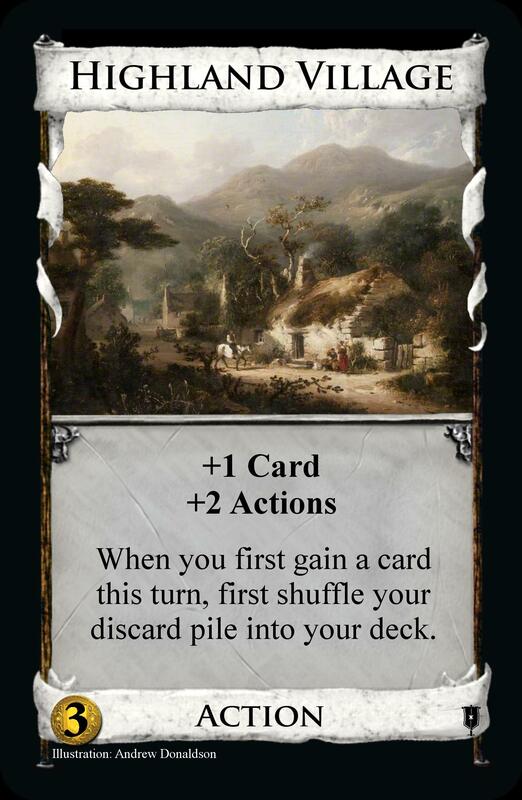 A set of simple cards needs a simple Village. How do you make one of those interesting? 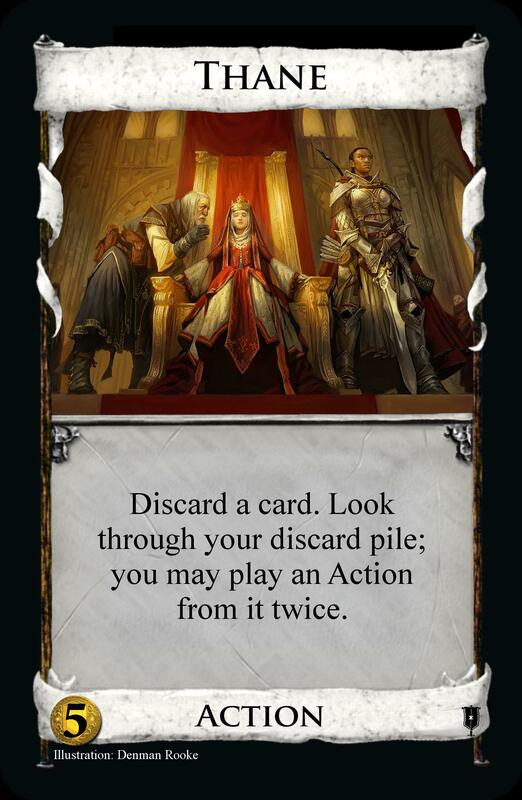 This one shuffles the discard into deck just before your first gain of the turn. Good for greens, bad for early building. So because it's sometimes better sometimes worse than base set Village this costs $3, the 'interest' I was trying for. I said I liked Throne from discard when I changed Taskmaster from Revolution. It's here now, simply discarding a card first with it. And the crazy one last. Completely block cards from entering anyone's deck, and from going back to the pile, by putting a State on the pile. Should I let it block Provinces...? More details on the OP. From these cards, there emerges a discard pile theme and a Buy phase theme. Engraver looks broken as it enables infinite loops (buy Copper, trash Copper for VPs). Doesn't seem to difficult to pull off something like playing 5 Engravers, trashing 5 Coppers, getting 15VPs and then buyign 5 Coppers to do the whole thing again next turn. 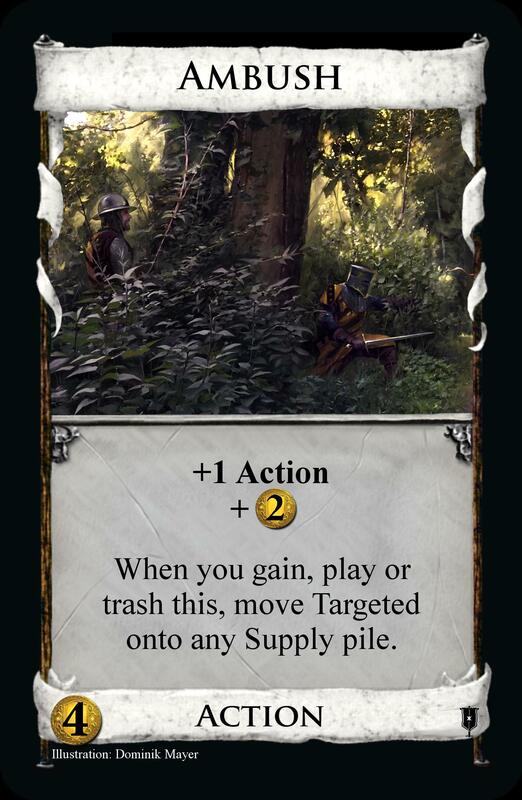 I like Ambush, it is a cool State idea. Goose: I like this one. A cool Rats variant. Thane: Throne Rooms are engine cards, so I don't think being able to look in your discard pile will end up being very useful. This idea doesn't really excite me overall; I feel that Ghost is a better implementation of this idea.